EAW013799 ENGLAND (1948). Minning Low and the surrounding dry stone walled fields, Minninglow Hill, 1948. This image has been produced from a print. 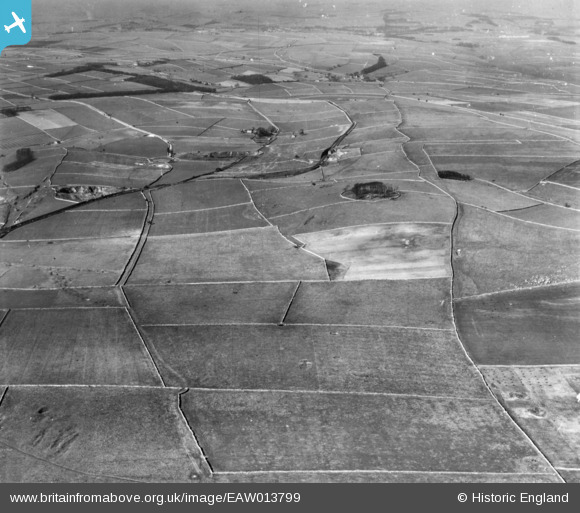 Title [EAW013799] Minning Low and the surrounding dry stone walled fields, Minninglow Hill, 1948. This image has been produced from a print. Gotham Curve, the UK's sharpest curve on a standard gauge "running line", as opposed to siding or dock. The line turned 80 degrees with a radius of 2.5 chains. It might not look very exciting on foot or on a bike, but in railway terms it was remarkable. A 5mph speed limit was imposed on all trains. The line through the curve was closed in 1967 and now forms part of the High Peak Trail.